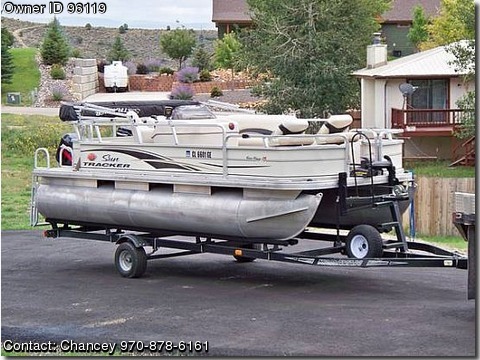 Call Boat Owner Chancey 970-878-6161 970-274-9483. Great Shape, Garage Kept since we've owned it. Comes with 50 HP Mercury 2 Stroke, 2011 5HP Mercury 4 stroke, brand new Minn Kota Pontoon electric trolling motor, gell cell battery, brand new Hummingbird fishfinder, Walker downrigger with 2 balls. Bimini top, brand new life jackets, anchor, brand new spare tire, trailer tie downs front and back, dock ropes, rod holders, trailer is a 2007. Bench seat has some cracks but other than that the search is over. I tried to think of everything when I out fit this boat. If you want to fish, sun, cruise, swim or downrigger fish stop your search.